Maps, the Apple mapping app that was first included with OS X Mavericks, is a popular and easy way to find your way around just about anywhere in the world. Many of the features found in the iPhone or iPad versions of Maps are also available to Mac users. In this short guide, we're going to look at using just one of the features of Maps: the ability to favorite locations. Favorites, also known as bookmarks in older versions of the Map app, let you save a location anywhere in the world and quickly return to it. Using favorites in Maps is a bit like using bookmarks in Safari. You can store frequently used locations in your Maps favorites to quickly bring up a saved location in Maps. But Maps favorites offer a great deal more versatility than Safari bookmarks, giving you quick access to information, reviews, and photos of the places you have saved. To access your favorites, click the magnifying glass icon in the search bar, or in older versions of Maps, click the Bookmarks (open book) icon in the Maps toolbar. Then click on the Favorites (a heart icon) in the sheet that drops down from the search bar. When the Favorites sheet opens, you will see entries for Favorites and Recents. Just below the Recents link, you will see your Contacts groups from your Contacts app. Maps provides quick access to all of your contacts, on the assumption that if the entries contain addresses, you may want to quickly map out the location of a contact. Favorites contains your saved spots. They may be restaurants, businesses, friends' homes, landmarks, or just places that you've stuck a pin in on the Maps application. Favorites starts out with an empty list, but you can easily add your favorite spots by using our Favorites tips, below. Recents contains a list of recently visited locations in Maps. Each time you enter an address in the search bar, use a favorite, or use a contact's address to go to a location in Maps, that location is added to the Recents list. Recents also includes any pinned locations, even when the pin doesn't have a name. Contacts contains all of your Contacts groups. You can click on any group to find a specific contact. You can also use the search bar within the Favorites sheet to find a specific contact. Contacts that include a useable address are displayed in bold text, while contacts that are missing address information are displayed with slightly grayed text. You can click on an address field in a contact to go to that location in Maps. 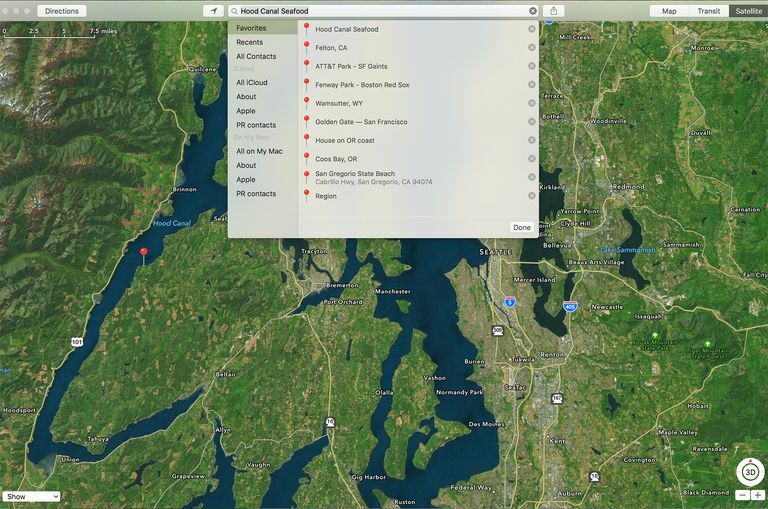 In this tip, we're going to concentrate on adding favorites to the Maps application. When you first start using Maps, the Favorites list is empty, ready for you to populate it with places you are interested in. However, you may notice that within the Favorites list, there is no method for adding a new favorite. Favorites are added from the map, using one of the following methods. If you know the address or place name for the favorite you wish to add, enter the information in the search bar. Maps will take you to that location and drop a pin with the current address on the map. Click the address banner next to the pin to open the information window. With the information window open, click the Add to Favorites button. If you've been wandering around a map and come across a location you would like to be able to return to later, you can drop a pin and then add the location to your favorites. To perform this type of favorites addition, scroll about the map until you find your desired location. Place the cursor over the position you wish to remember, then right-click and select Drop Pin from the pop-up menu. The address displayed in the pin's banner is a best guess about the location. Sometimes, you'll see a range of addresses, such as 201-299 Main St. Other times, Maps will display an exact address. If you add a pin in a remote area, Maps may only display a region name, such as Wamsutter, WY. The address information the pin displays is dependent on the amount of data Maps contains about that location. Once you drop a pin, click on the pin's banner to open the information window. If you want to save the location, click the Add to Favorites button. Make sure the area you wish to favorite is displayed within the Maps window. It's best (although not required) if the location you're interested in adding as a favorite is roughly centered in the map viewer. From the Maps menu bar, select Edit > Add to Favorites. This will add a favorite for the current location using the regional name. The regional name appears in the Maps search toolbar. If no region is listed, the added favorite will end up with the generic “Region” as its name. You can edit the name later using the instructions below. Adding a favorite by using the menu doesn't drop a pin at the current location. If you want to return to a precise location, you're better off placing a pin using the instructions for dropping a pin, above. You can change a favorite’s name or delete a favorite using the editing feature. You can't, however, change a favorite’s address or locational information from the favorites editor. To edit a favorite’s name to make it more descriptive, click the magnifying glass icon in the Maps search toolbar. In the panel that appears, select Favorites. In the new panel that opens, click the Favorites item in the sidebar. Click the Edit button near the bottom right of the Favorites panel. All of the favorites can now be edited. You can highlight a favorite’s name and type in a new name, or make edits to the existing name. To delete a favorite, click the remove (X) button to the right of the favorite’s name. Favorites that have pins associated with them can also be deleted directly from the maps view. Position the map viewer so that the pinned favorite is visible. Click the pin's banner to open the information window. Click the Remove Favorites button. Favorites are a handy way to keep track of places you have visited or would like to visit. If you haven't yet used favorites with Maps, try adding a few locations. It's fun to use Maps to see all the places you think are interesting enough to add as favorites. Did You Know Apple's Address Book Could Do This?